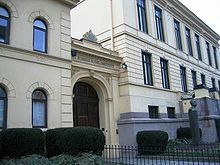 Two of the Nobel Committees, those for physics and chemistry, as well as the Prize Committee for economics, are located at the Royal Swedish Academy of Sciences. The Nobel Committee for Physiology or Medicine is located at the Karolinska Institute. The Nobel Committee for Literature is located at the Swedish Academy. The Norwegian Nobel Committee, appointed by the Storting, has its own supporting body in the form of the Norwegian Nobel Institute.